Think Again! 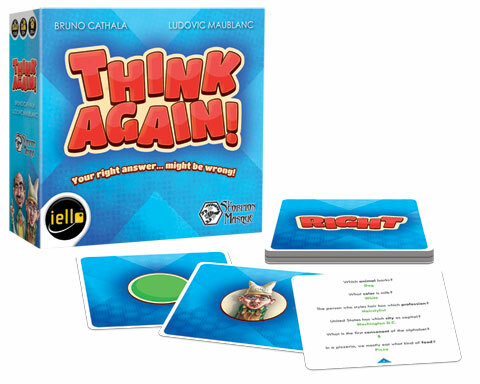 is a game by Bruno Cathala and Ludovic Maublanc and published by Iello and Le Scorpion Masque. It is for 3-10 players. In this game, players take turn reading questions and trying to answer questions as quickly as possible. However there is a twist, sometimes the answer isn’t what you think it is. That’s the beauty of the game. This game can be played as individuals or as teams. To begin simply shuffle up the question cards and give them to the first player. That person will ask 5 questions over the course of the game. After each question, the player reading the question will then reveal the back of the next card which dictates how the other players have to answer. To answer correctly they will have to match their answer to how the card tells them to answer. For example, if there’s a green dot, the word right, or the face of the genius, the answer must be the right answer. However, if there’s a red dot, the word wrong or the face of the dunce, the answer must be incorrect. Take this question for instance, What color is milk? The right answer of course is white. However, if you had to answer incorrectly you could say any color but white. To make things more crazy, there are questions that are included that have the words absurd question underneath them. When this question is asked, the only answer is “Think Again”. The first person to answer the right way, gets a point. After each player has asked 5 questions, the game is over and scores are added up. The player with the most points is the winner. Simple. Components are simply a deck of square cards. That’s pretty much it. Unless you count that the box has this really cool little magnetic closure on it. Speaking of the box, it’s small and very portable. The cards are nice and smooth with easily readable print and nice artwork of the designers, Bruno Cathala and Ludovic Maublanc as the genius and the dunce. Nicely done. No need for really anything else. The rulebook is made from several of the square question cards. They are not bound together but they fit in really well with the other cards. The rules are easily explained and a few pictures are added. Nice idea. The game is simple enough to play. It doesn’t take long and it will lead to lots of laughter. The most fun we had in playing was asking the absurd questions and watching people mess up their answers. I fell prey to the question about Cinderella’s dwarves. Cinderella didn’t HAVE dwarves! It was Snow White. Well played wife, well played. I could easily see this game being taken to family get togethers. Think Again! is a light game of trivia with a twist. Expect to laugh out loud or LOL as the kids say these days, while playing this one. One word of advice though, the answer you think you know, might be the wrong one. I guess you better, Think Again! See what I did there. Huh, huh? For more information, please check out Iello Games at the links below. 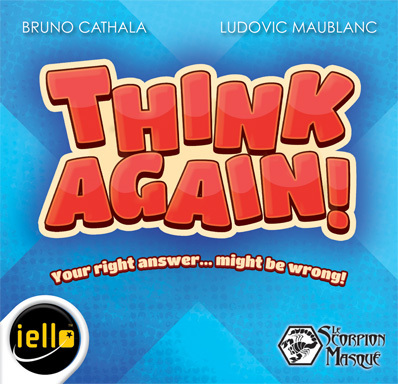 This entry was posted in Reviews and tagged again, board, board games, bruno, bruno cathala, card, card games, cathala, game, iello, le, le scorpion masque, ludovic, ludovic maublanc, masque, maublanc, review, scorpion, think, think again. Bookmark the permalink.